These are the most decadent brownies ever! 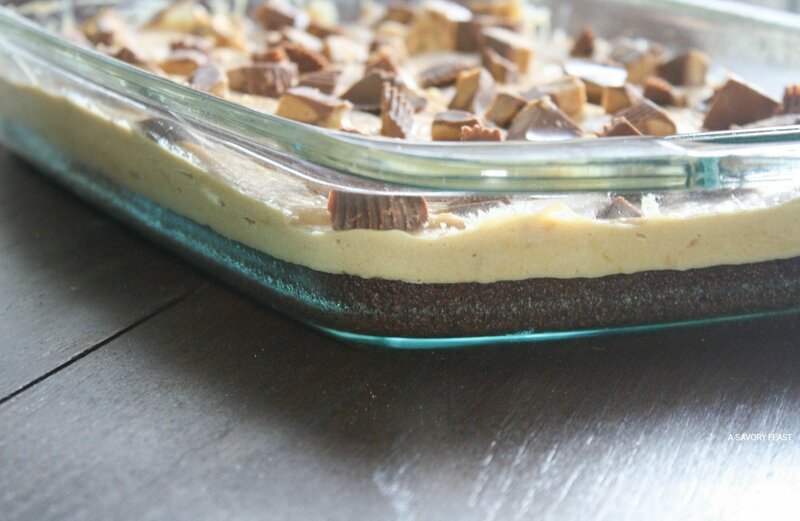 Start with your favorite boxed brownie mix and top with a peanut butter cheesecake layer and Reese’s Peanut Butter Cups. This post contains affiliate links. If you make a purchase through these links, I will make a small commission. I’ve got a weakness for anything that combines peanut butter and chocolate. When it comes to dessert, I’ll usually gravitate toward something with that combination. For these brownies, I started with my favorite boxed brownie mix. Next comes a layer of creamy peanut butter cheesecake. 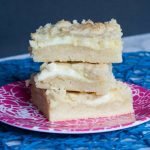 It has a frosting-like consistency and tastes incredible! Finally, I chopped up a bunch of Reese’s Peanut Butter Cups and used them as a garnish for the bars. I made these bars for a friend’s going away party and everyone loved them! They were gone before I knew it. 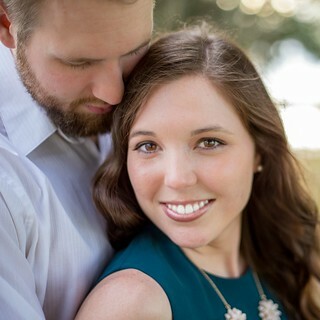 Let me tell you, I had the toughest time editing these pictures and putting this post together because I wanted to stop what I was doing and go make another batch! Trust me, you don’t need an excuse to make this delicious dessert. Treat yourself this week! These over-the-top brownies are 100% worth it, for sure. 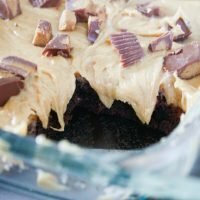 Every time I make these brownies they are always such a hit! It’s such a great way to take a basic boxed brownie mix and turn it into a special, decadent dessert. 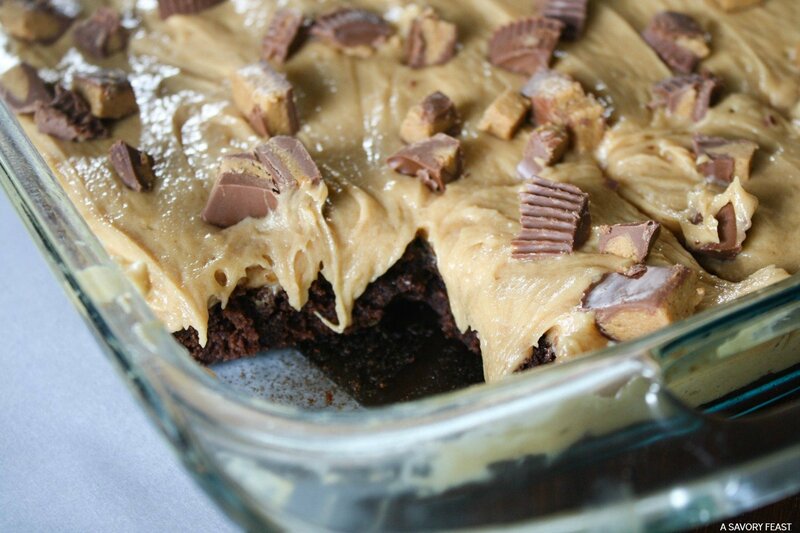 This treat will definitely satisfy your late night chocolate and peanut butter cravings! It’s also great for parties or just having some friends over for dinner and dessert. 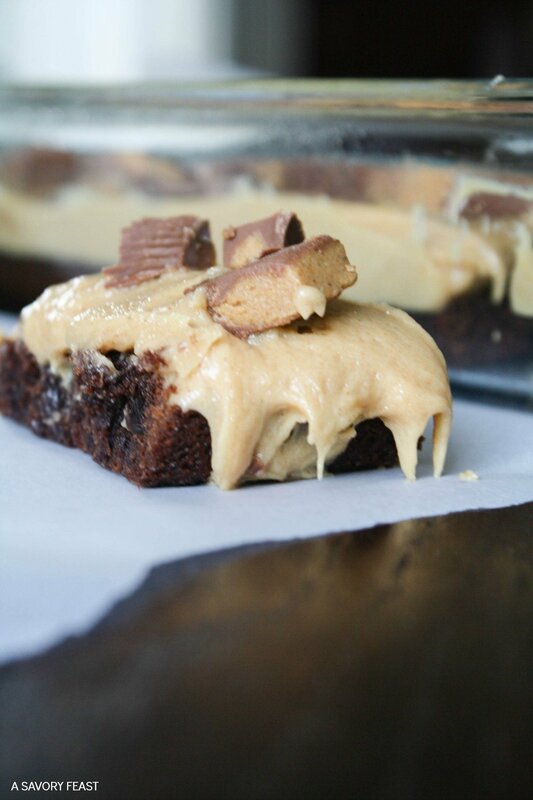 See how I made these Peanut Butter Cheesecake Brownie Bars in the video below! These are the most decadent brownies ever! 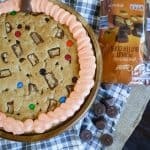 Start with your favorite boxed brownie mix and top with a peanut butter cheesecake layer and Reese's Peanut Butter Cups. Mix and bake the brownies according to the directions on the box. Allow the brownies to cool completely. In a large mixing bowl, combine the cream cheese and peanut butter. Add in the powdered sugar and milk, a little at a time. Mix until smooth and creamy. 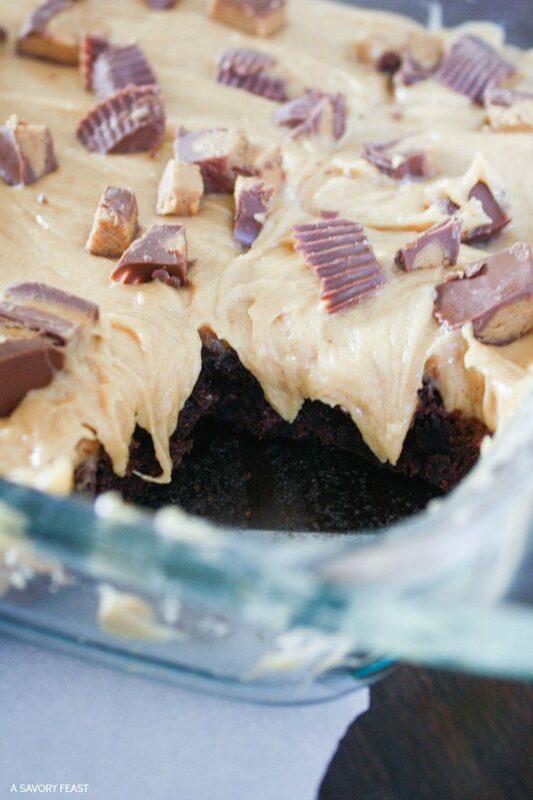 Spread the peanut butter mixture on top of the brownies. 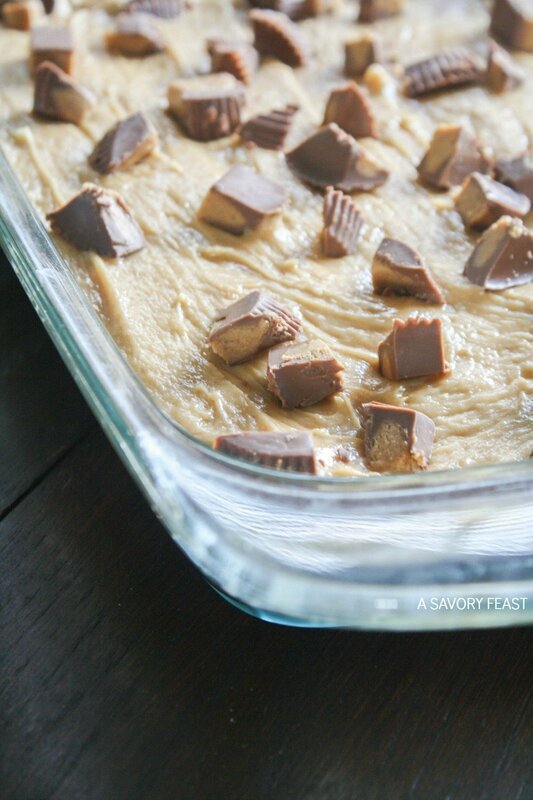 Use a knife to chop the Reese's Peanut Butter Cups into small chunks. Sprinkle the chunks on top of the peanut butter layer. Refrigerate for an hour or more before cutting into bars and serving. What is your favorite flavor combination for desserts? Are you as obsessed with chocolate and peanut butter as I am? That looks delicious! That recipe is very similar to something my husband makes. Have a terrific week! It’s so yummy, isn’t it? Oh my goodness, these look divine. 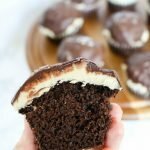 Chocolate, peanut butter, and cream cheese are pretty much my three favorite things in the world, so I’d have to keep myself from eating an entire pan of these. It’s sooo hard to stop eating these! They are so yummy. It’s my favorite combo, too! Oh my word these look AMAZING!! They are incredible! You should try them ASAP. These look incredible! These are like three of my favorite things combined! I’m sure you will love these! 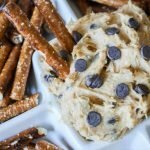 My family will love these, great post. Thanks! I’m sure they will! Enjoy. We made these last weekend, and they were so good! I gave half the pan away because we wanted to eat ALL OF THEM! Seriously, amazing. I could (but shouldn’t!) eat entire bowls of that peanut butter cheesecake topping! OMG they are so dangerous, aren’t they?! I could eat wayyy too much. Thanks Tonya! I’m so happy your family loved this recipe. It’s one of my favorites too!